The Vault – We’re In this Nsfw Clip! Ben: What was that? That was strange. Mya Denton: [in bed] Come back. Ben: The TV turned itself on. Mya Denton: [reaching out] Come back. Courtesy of Immediate Music LLC. 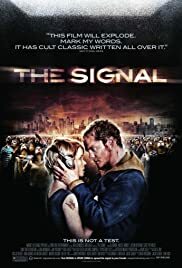 Q: What is the Signal? Q: Which director handled which segment of the film? Q: Why was everyone trying to kill eachother? now this was an interesting premise for a movie,, you turn on you're TV, cell any modern device and through the frequency out comes this sound unimaginable that goes into you're head driving you to commit murder and all things full of mayhem and unrest. the movie is done by 3 different directors,, each dividing time up in thirds,, never seen that one done before like that. sure there's not a lot explained in the movie and yes you have to think and use you're imagination to some degree. there's lot's of action, mystery and thrills in this movie, some sci-fi elements as well. although not a classic by any stretch of the imagination.. this is not a total stinker either.. this is just one of those movies that it's kinda hard to understand at first , and will leave you with a few questions at the end,, the whole point of the movie is the journey that you take getting there, so far me it was slightly above average.